While the high and low ends are thriving, the middle of the market is in trouble. 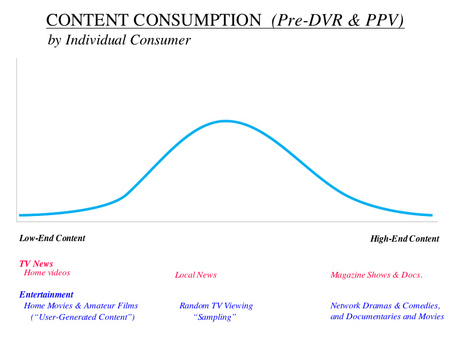 Now, while I originally started writing about TheCurve focusing on evolution of the consumption of television content (see graphics below), I later began posting about other areas that adhere to TheCurve, along with Adam Park's observations about TheCurve and consumer electronics. And although Surowiecki never graphically drawers TheCurve, in this week's New Yorker he does write about how the consumption of consumer electronics has shifted from "the amorphous blob of consumers who make up the middle of the market to the high and low ends." For Apple, which has enjoyed enormous success in recent years, “build it and they will pay” is business as usual. But it’s not a universal business truth. On the contrary, companies like Ikea, H&M, and the makers of the Flip video camera are flourishing not by selling products or services that are “far better” than anyone else’s but by selling things that aren’t bad and cost a lot less. . . unlike Apple, the companies aren’t trying to build the best mousetrap out there. Instead, they’re engaged in what Wired recently christened the “good-enough revolution.” For them, the key to success isn’t excellence. It’s well-priced adequacy. These two strategies may look completely different, but they have one crucial thing in common: they don’t target the amorphous blob of consumers who make up the middle of the market. Paradoxically, ignoring these people has turned out to be a great way of getting lots of customers, because, in many businesses, high-and low-end producers are taking more and more of the market. In fashion, both H. & M. and Hermès have prospered during the recession. In the auto industry, luxury-car sales, though initially hurt by the downturn, are reemerging as one of the most profitable segments of the market, even as small cars like the Ford Focus are luring consumers into showrooms. And, in the computer business, the Taiwanese company Acer has become a dominant player by making cheap, reasonably good laptops—the reverse of Apple’s premium-price approach. Technology moves things to the extremes. Indeed, that's what happens whenever disruptive influences enter an ecosystem. The result of all of the time shifting, sharing and storage, of course, is that people are no longer eating the middle of the curve and instead are saving up the high-quality stuff to eat later and noshing on the low-quality stuff (mostly thanks to YouTube) whenever they want to see a cat flush the toilet, a bull dog ride a skate board, a skate boarder crash or an infinite number of other things to entertain themselves for a moment, at that moment. ONE OTHER THING THE CURVE TELLS YOU: BRANDS MATTER LESS AND LESS. 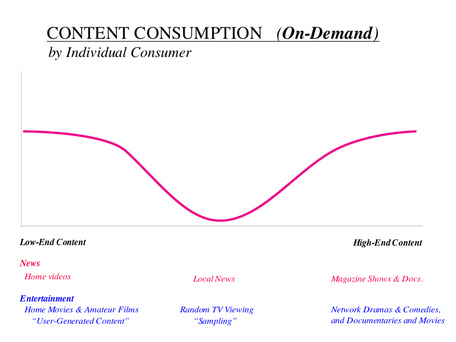 The reason, as noted earlier in "Consumer Goods and TheCurve," is that as the cost of production and distribution drop, goods inevitably become mass produced commodities — not just consumer goods but all forms of content and entertainment. More on how technology moves things to the extremes — including the world of sports and sports fans' behaviors — in posts to follow.